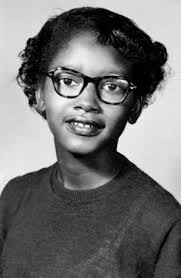 Claudette Colvin was born on September 5, 1939. Mary Anne & C.P. Colvin adopted Claudette. Mary Anne was a maid and C.P. Colvin moved lawns for a living. Claudette learned a young against that her world was different. She was raised in a poor black neighborhood and saw first hand the struggle of segregation. Claudette’s friend was put to death after a flirtation with a white girl. Seeing things like that made Claudette aspire to be a lawyer and fight for civil rights. On March 2, 1955, after boarding a Montgomery Bus her life was set to change. On her way home from school, 15-year-old Claudette refused to give up her seat, and was dragged off the bus and charged with violating segregation laws, misconduct, and resisting arrest. She was sitting the designated section for color people but due to the bus being crowded she was asked to move. So before you think of Rose Parks, know that Claudette was the first person arrested for disobeying bus segregation. Claudette was looked at to be the face of the boycott movement, but due to her becoming pregnant it was not offered. Rosa Parks soon became the face of the boycott movement. Claudette did become apart of a lawsuit Browder v. Gayle. She was one of five plaintiffs. After her case was over and the bus segregation ended, Claudette gave birth to her son Raymond on March 29, 1956. She had a hard time finding jobs so she life Montgomery for New York. After landing in New York, she found a job as a nurse’s aid and worked for 35 years. She has another son, who grew up to be an Accountant in Atlanta. She felt disappointed that she never got the recognition she deserved. ← Are Celebrities Obligated to Use Their Platform to Acknowledge Social Issues?